"[My wife] introduced me to this Christian group. It somehow inspired me to open up and accept the Lord in my heart. I realized now that I was such a crazy person. I did things that I later realized were not really acceptable. I took things for granted and abused whatever fame I got. I accepted all my faults and all my sins and asked the Lord for forgiveness. That really changed my life for the better," says the former cager who used to date Rufa Mae Quinto. 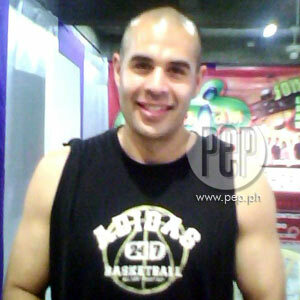 Marami ang natuwa nang mabalitaang nagbagong-buhay na ang former PBA player na si Hatfield Hatfield. Mula sa pagiging sikat na basketball player, isang missionary na si Hatfield para sa isang Christian group sa U.S.
Isa sa hinahangaan sa hardcourt ang Fil-American na huling naglaro para sa teams ng Barangay Ginebra King, San Miguel at Coca-Cola. Una siyang nakilala sa team na Laguna Lakers noong panahon ng Metropolitan Basketball Association (MBA). Ngayon ay pinagpaliban muna ni Hatfield ang basketball para sa kanyang bagong career bilang missionary para sa Megacity Ministries, Inc. Sa panayam namin sa kanya ay nagsimula ang kanyang spiritual life nang umuwi siya sa U.S. noong 2005. Doon na raw unti-unting nagbago ang kanyang pamumuhay. CHANGE FOR THE BETTER. "When I left the Philippines in 2005, I really said to myself that I will forget playing basketball and focus on something else. I had my time and I know that the fame of being this player will not last long. So when things were going crazy here for me in regards of the citizenship and other legalities, I decided to pursue a different career after basketball. "I worked in a computer company back in the U.S. and I did a few other jobs before that. It was a different life for me. I was away from the wild and screaming fans that mobbed us whenever we have a game. It became a normal life for me back in the U.S. I was working on a nine to five job which I never got used to before. But I adjusted and really focused on the life I have exchanged for playing basketball." "I met my wife here in the Philippines. She's been visiting the country and have stayed here long as well. When we decided to start our life as husband and wife in the U.S., she introduced me to this Christian group that she frequently attends called Megacity Ministries, Inc.
"I attended a few sessions with her and it somehow inspired me to open up and accept the Lord in my heart. I realized now that I was such a crazy person. I did things that I later realized were not really acceptable in life. "Before it was just a fun thing to do, because I never really felt anything to be sorry for. I took things for granted and abused whatever fame I got. I never realized that it was the Lord who gave me the talent to be good at what I do but I never saw or felt that. "Then all of a sudden I was repenting for all the bad things I did in the past. I accepted all my faults and all my sins and I asked the Lord for forgiveness. That really changed my life for the better. "Now I am helping out spread the good words of the Lord. I've been with this missionary group for almost a year now and we've been giving inspirational talks to the youth and different people all over the U.S. and in other countries as well. "The experience of all of this has made me a better man than before. I am a much happier man now and more fulfilled. I might have fame before but I was so empty and didn't know where to go. Now I know where the light is," malaking ngiti pa ni Hatfield. PLAYING BASKETBALL FOR THE LORD. Bumalik si Hatfield kamakailan sa Pilipinas dahil may outreach program ang Megacity Ministries sa Community Baptist Church sa Pasig City. Part ng pag-uwi rin ni Hatfield ay ang tumulong sa Youth Jam Student Center para sa kanilang Hoop Heaven International Basketball Clinic. "I'm a little rough on the edges since I haven't been playing basketball for four years now. But I still got the moves and I want to share a few what I know about the sport with the youths of Pasig City. "When they asked me if I am willing to teach for a few hours in their basketball clinic, I said yes right away because I really missed basketball and it was a big part of my life before I started a new life with the Lord. In this way, I can share whatever knowledge I know about the sport and, at the same time, teach them how the Lord works in the most wonderful and amazing ways possible." Sa maigsing panahon na nandito si Hatfield, nakipagkita siya sa ilang mga dating teammates sa hardcourt. "My former teammates were both happy and shocked by the changes they saw in me. But they are willing to support the many projects that our missionary group would be doing here in the country. "They helped out when we donated and distributed relief goods to the people of Pasig City who were victims of the typhoon Ondoy. They also said to just give them a call and they will help us out in other charity projects, which I really appreciated a lot. It's a really big help and many people will benefit from their unselfish actions." HAPPY FOR RUFA MAE. Game na ngayon si Hatfield na mapag-usapan ang kanyang personal na buhay noon. Dati ay todo-iwas siya kapag iyon na ang napag-uusapan. Nang tanungin nga namin siya kung nagkita na sila ng ex-girlfriend na si Rufa Mae Quinto, ang sagot niya ay matagal na raw silang hindi nagkikita at nagkakausap. "Since I left in 2005, I never had a chance to talk or even see her. That was the time when things were really getting crazy and we both wanted our own space. So after we broke up, we never communicated. I don't know why but I guess it was for the better. I am praying that we are still friends after all that happened. "Rufa Mae is a great and hardworking girl. She loves her family and would do anything to keep them safe and happy. Someone told me that she's also attending a Bible group. Well, good for her and I am happy for that news. At least, she doesn't forget to thank the Lord for all the blessings that comes her way." Napangiti si Hatfield nang sabihin naming engaged na si Rufa Mae at may planong mag-settle down sa U.S. next year. "That's great news!" ngiti niya. "I didn't know that, so I really must congratulate her because things are really going great for her. She has her showbiz career, a great relationship with the Lord and now, she's engaged to be married. "Really, I am happy for what Rufa Mae is achieving now. I pray that she takes good care of all these blessings and never forgets to thank the Lord for all of these. I wish her good luck in everything and that she continues to feed on the words of God for spiritual guidance in her life," pagtatapos ni missionary Rudy Hatfield.